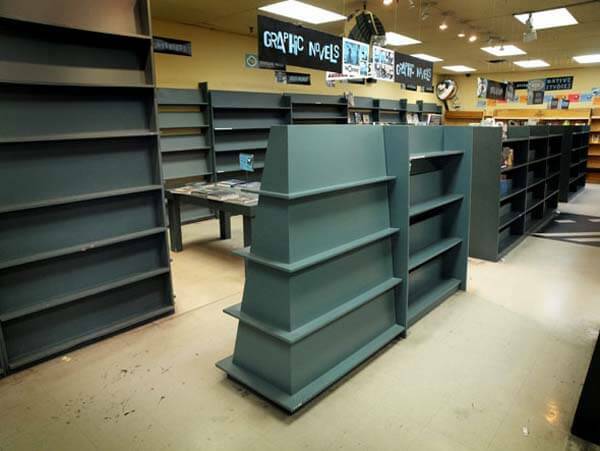 Pages Books' bare shelves in its final days of business. Photo by Rick McGinnis. On a warm night in early September, several hundred people gathered at Toronto’s Gladstone Hotel to hold a wake for a bookstore. For 30 years, until its closing at the end of August, Pages Books, located in the heart of the city’s Queen Street West neighbourhood, had been one of the premier destinations for books on contemporary art and cultural and literary theory, while serving as a major conduit for the area’s small press. As one speaker after another shared their thoughts on Pages’ closing, it became clear that no one is certain who or what will replace the role that Pages played in the city’s literary and artistic community. No one dared suggest the massive Chapters-Indigo bookstore just down the street. The very fact that so many people came out to lament the closure of a store is a clear indicator of how important independent bookstores have been to their local communities. Yet, for all their social and cultural impact, the future of indie bookshops is in doubt. The independent bookseller in Canada has had a rough ride in recent years. The disappearance of Pages follows hot on the heels of the closing, earlier this year, of Toronto’s Mirvish Books, perhaps Canada’s most prestigious art bookstore. Vancouver and Halifax have also been hit by a wave of bookstore closures; the once-thriving Duthie’s Books chain in British Columbia is down to only one location closed as of the end of February, 2010. No fewer than three major upheavals have hit the world of book retailing in the past two decades. First came the big-box book retailers, Chapters and Indigo, now united as a near-monopoly, accounting for some 70 percent of book retailing in Canada; then came the internet and online book sales; and most recently the rise of the eBook, which promises (some would say threatens) to turn the book into yet another piece of software. It was the first of those upheavals—the big-box retailers— that did the most damage to the independent neighbourhood bookstore. Some 350 indie bookstores closed across Canada in the past decade, and, according to Susan Dayus, executive director of the Canadian Booksellers Association, much of that had to do with the arrival of the Chapters chain. Chapters seemed to have tried that strategy with Pages, setting up a sprawling location one block south of the landmark bookstore. But the strategy didn’t work. “We beat them in the sense that we survived,” says Marc Glassman, founder and owner of Pages. He notes that, as Chapters and Indigo expanded across the city and the internet attracted book buyers, Pages’ own sales continued to climb. What killed Pages, in the end, was the rent. At $270,000 a year, Glassman’s lease was simply unaffordable for a mom-and-pop bookstore. It’s a pattern that has been repeating itself across major Canadian urban areas. “Vancouver has lost an incredible number of bookstores,” James Mullin, co-owner of Vancouver’s Tanglewood Books, said in an interview last year. “I am literally in the last building in this area that I can afford, and it’s not because of the revenue or that business is terribly poor.” High property taxes and rental costs are hard on Vancouver’s independent businesses he said.